Alabama has passed a law requiring Marketplaces to collect and remit sales tax on sales facilitated through the marketplace effective January 1, 2019. Amazon began this collection on 1/1/19. Walmart began this collection on 4/1/2019. eBay will begin this collection on 7/1/19. You can view more detail from the state regarding this here. If you sell through a Marketplace that has agreed to begin collection in this state, you'll see sales tax collected in Alabama for sales on and after 1/1/19 on your TaxJar Dashboard and on your Alabama Transactions page. If you are currently opted in to receive email reminders for your sales tax due dates, you'll also see Alabama listed as a state where you have an upcoming monthly return due in those emails. I've never registered for an Alabama license. Do I need to register for a sales tax license in Alabama now? If you have never registered for a sales tax license in Alabama and your only sales in Alabama are through a Marketplace that is collecting as a Marketplace Facilitator, then you will not need to register for an Alabama sales tax license. I have already registered for a license in Alabama but and all of my sales are Marketplace-only sales. Should I cancel my existing registration? Yes. Please call the state's sales tax department at 334-242-1490 to close any accounts that are no longer needed. Please note that if you have previously collected and remitted any county and/or city taxes, you will will need to contact the administrator of any non-state administered localities you have registered with to let them know that you will no longer be collecting/filing for that locality. Contact information for these localities can be found here. Do I need to collect taxes on my Alabama sales on other platforms? Yes. If you have nexus in Alabama ( physical or economic) and make sales to customers in Alabama on non-marketplace platforms, you'll need to have an active registration and collect sales tax or seller's use tax on your non-marketplace sales. Do I still need to file returns in Alabama? If you are registered in this state (which you'll need to do if you have physical or economic nexus and you make Alabama sales on platforms that are not Marketplace collected), you will need to file Alabama returns. I still need to file returns in Alabama. How do I do this without paying double tax on the sales that were collected and remitted by my Marketplace? When you file, you'll include the marketplace sales totals in your Gross Sales Total. 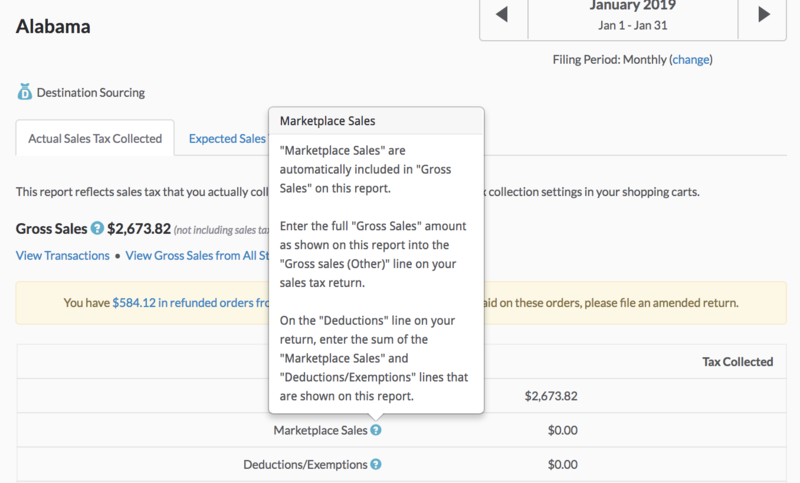 Then, you'll deduct the Marketplace collected sales totals, along with any other exemptions or deductions. Once you do this, the state's return form will show you a calculation for your total taxable sales amount. How does this affect my TaxJar Report for Alabama? Your TaxJar Report for Alabama has been updated to reflect the sales that had tax collected and remitted by Amazon. You'll see this change in Alabama sales tax Reports for periods starting in January 2019 and moving forward. The marketplace sales totals in this Report are now called out in the Marketplace Sales row of the Report.